Stoma surgery can often be an overwhelming experience, but being well prepared before and after surgery can make a big difference for you and your recovery. 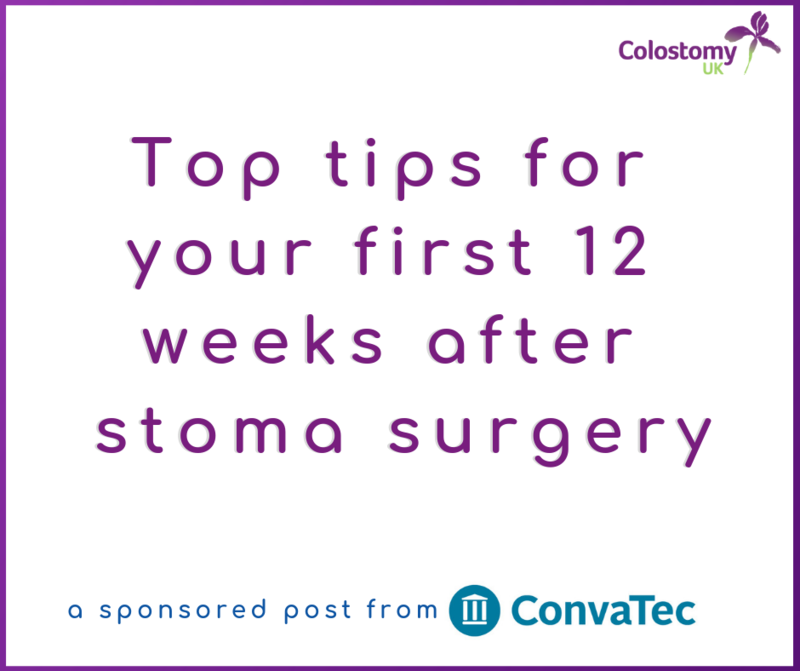 To help you through the first 12 weeks after stoma surgery, ConvaTec have put together a handy guide to what you can generally expect with each stage of your recovery. When you first wake up following stoma surgery you will be wearing a pouch over your stoma. You may hear this be called a bag, a pouch or even an appliance. You may find your stoma may not work for 24 hours but don’t panic as this is quite common depending on your type of stoma. At first, your stoma may seem to be larger than you expected, but this is normally caused by the effects of surgery and will reduce as your recover (this can take up to eight weeks). To help reduce any adverse effects from the shrinking stoma such as leakage, ConvaTec Mouldable™ Technology stoma solutions can help give you a secure seal without the need for cutting. The ward staff or stoma nurse will help you care for your stoma at this stage. You might have to stay in hospital for up to two weeks following surgery, but this can vary from person to person depending on the type of operation and your general health. During this time, it is very normal to feel overcome with emotions. You may find yourself feeling confused, sad, angry or generally fed up, or you may have a mixture of these emotions. Try not to worry as these feelings are completely normal and should diminish as you start to adjust to life with a stoma. If you feel like this then you can talk to your stoma nurse who will give you a follow up plan on discharge. This may include home visits depending on your area. As you learn to care for your own stoma, you may also find the need for an adhesive remover to help you gently remove the pouch. ConvaTec’s Niltac spray can help with this, and wipes can also be used to prevent the build-up of adhesive on the skin. During the first few months after stoma surgery, it is important to recognise that you and your loved ones will be undergoing a major period of adjustment. Having a stoma means you need to adapt to a new “normal” way of life. As you start to feel better the chances are your appetite will improve and your body shape may change as a result. If this is the case, then it may be necessary to be reassessed to ensure you are wearing the right pouch. Not only can learing the right pouch increase your confidence, it can reduce discomfort, prevent leakage, as well as help you to get back to the activities you loved to do before your surgery. Your stoma nurse can advise on what products are available or alternatively Convatec’s Product Specialist can give advice over the phone and send samples if appropriate. If they can’t help you, they can refer you to the Nurse Advisor Line where a qualified stoma nurse can assess your issues, and if needed can refer you to an Amcare Group™ Nurse specialist who can visit you at home. 12 weeks on and you should be starting to feel much more comfortable and confident with your new lifestyle as stoma management becomes a more routine part of your life. This could be a good time to start revisiting the activities you enjoyed before your surgery such as swimming, golf, archery and more. Once you do start to become more active you may find the product you were using may not be suitable. ConvaTec has a full range of one and two-piece products, flat and convex which provide solutions to fit around you and your lifestyle. During this initial adjustment period, however, make sure to keep in close contact with your stoma care nurse. The answers to any problems or concerns are usually just a phone call away. It’s widely acknowledged that a healthy lifestyle can improve mental health and aid recovery. Active can mean something as simple as carrying your food shopping to the front door or playing with the kids. It could also mean walking, jogging or even more strenuous sporting activities like running, cycling or competitive sports. It’s important to find the right type and level of activity for you, but every little helps. Adjusting to life with a stoma may feel like a challenge, physically and mentally, but just know that you are not alone. Your stoma care nurse and healthcare professionals are there to help you every step of the way. So are we. If you do feel like you are struggling to come to terms with adapting to life with a stoma and feel you need that extra bit of support, the ConvaTec me+™ counselling service could help. Offering free confidential advice and support no matter what stage of recovery you’re at, you can speak with one of our experienced counsellors who are here for you when you need it most. This post was paid for by Convatec, other stoma bag services and appliances are available. Colostomy UK are impartial and do not recommend one brand over another, always consult your stoma care nurse. We are not responsible for the accuracy/services of third parties.